It was so engaging to learn about Maltese people and culture through stories of locals and immigrants living in Malta. For example Malta’s Hypogeum’s neighbor; people of Marsaxlokk fishing village; a native of Mdina and the Indian student studying in Poland and working in Malta. Have you been fascinated by stories of people and places? Who was here before us? What happened to them? What did this place look like then? What is life like today? What does the future hold? One of our favorite ways to these answers is through stories of peohttps://storyateverycorner.com/5-days-in-malta/ple living in these places. It is enriching to hear stories such as those in Rajasthan, Sarajevo’s tunnel, Sarajevo under siege and more. To me, history is the collection of human stories. There was a slightly open garage door next to the Hypogeum’s entrance. (It’s probably a shutter to a storage room with a door that opens upwards and looks like a typical garage door in the US). A handsome older gentleman was squeezed under the garage door, working on something. It got me wondering what he was doing. Why was the garage door next to the hypogeum entrance? Why was the man in it? Who was he? He seemed friendly because he voluntarily suggested we fix our parking on the one-way street to prevent a parking ticket. I needed to find out more about him and the neighborhood. Here is our conversation converted to an interview, paraphrasing what we spoke to the best of my memory. Us: What are you doing in the garage? HN (Malta’s Hypogeum’s Neighbour): I’m fixing something that’s stored inside. Us: Why are you slouched inside the tiny opening instead of opening the shutter all the way? HN: If I open it all the way, it will be inconvenient to the visitors walking on the sidewalk. Also, I don’t want people to see the mess inside (he says with a chuckle). Us: What’s up with this garage next to the Hypogeum’s entrance? HN: This is part of my house. I’ve lived in this house for the entire 71 years of my life! Us: Wow! You’re the next door neighbor of such an important pre-historic site! What do you think about so many visitors coming to your street every day? HN (unfrazzled by the recent construction, the overhaul, and the many tourists): I’m happy to help visitors find their way, answer questions, park or anything else. I know I’m doing my part in Malta’s economy. (I wasn’t expecting a 71-year-old taking such change in stride. He was able to see the big picture and how important tourism is to their economy. He felt good about playing his part). Malta’s Hypogeum’s Neighbour, telling us stories about his neighborhood. Us: Did you lose parts of your house to archeology? HN (Malta’s Hypogeum’s Neighbour): Our house was not impacted because the hypogeum site is next to us but the house behind us was affected because it was on the site. Us: What was this place like before it became this fancy museum and important archeological site? HN: As kids, we played on the streets and the underground halls. We didn’t think of it as anything more than our playground. Over the years it served different purposes. During the war, it was our underground war shelter. The neighborhood used it as a protection from the bomb threats. Us: Since this was a burial site for hundreds of years, back in 3000-4000BC, did you find bones or other remains from those times? HN: Yes we found bones and other things as we played in the underground. But, the bones were so old that they disintegrated to the touch. Malta’s Hypogeum’s neighbor telling about his life on this very street. Us: What job do you? HN (Malta’s Hypogeum’s Neighbour): I’m enjoying my retired life with just me and my wife living in the house now. I worked in the post office for my entire working life of 45 years. Back in the day, Malta’s economy was not good like today. There were very few jobs, so if we got a job we stayed with it. Post office job was a very good one. I did well. Us: Do you have children? HN: I have two sons and grandchildren. They all live in other cities in Malta. We’re going to visit them tomorrow for our granddaughter’s birthday. Us: How long have these houses been here? HN: A few hundred years. They were made with the local limestone mixed with plaster. Malta’s historic Hypogeum is located on a quiet street in a family neighborhood, very symbolic of Maltese people and culture. Us: Is there a café you would recommend nearby? HN: haha. I live here! My wife cooks really very well. I’ve never been to a café near here. I should go home now. Hypogeum’s neighbor in Malta – a considerate, kind and friendly native of this street. I was secretly hoping he would invite us to his house for coffee, so we could see what one of these 300-400 hundred-year-old houses looked like on the inside. Oh well.. we headed around the corner and found an Irish family also coming out of the Hypogeum, in search of a café. As we were aimlessly wandering the streets of Birgu, we stopped passersby to take a picture of us. If they seemed friendly, I struck a conversation to see where it would go. One of these persons started talking with us about India and where we came from. He had been to many Indian cities although he couldn’t remember all the names. Soon enough we were deep in conversation. Wandering the streets of Birgu in Malta. He started asking us why we came so far to Malta from California, there could be many other places to visit. But soon he learned that our curiosity and sense of wonder takes us to all kinds of places, so why not Malta? We’ve traveled to over almost 100 countries, so why not Malta? We love history and culture and nature and everything quirky, so why not Malta? We soon found that he has one of most interesting careers one could imagine! Here are some excerpts from my memories of the chance encounter. Us: How do you know so much about India? Pilot in Birgu, Malta: I was a pilot in Pakistan Air Force! So I flew all over India. Thereafter I flew passenger aircraft. Us: Which airlines do you fly now? Pilot: I retired from commercial flying. Now I fly private charter aircraft for the rich and famous of the world. Us: What do you mean by the rich and famous? Pilot: I fly royal families, football (soccer) and sports teams, anyone who doesn’t fly commercial airlines or if their own private jets are busy. Us: What is it like to fly a football team? Us: you mentioned the royals. Which royal families have you flown? Pilot: I’ve flown members of the extended royal family of England and those of Arab countries. The royal families have their own aircraft but if their aircraft are busy flying other family members they use the charter flights. Us: What is it like to fly British Royals? Pilot: All our clients are very private we provide the flight service but don’t interact with them. We have a wide range of aircraft. Depending on the clients’ needs we use smaller or larger aircraft. Us: Do you have any stories about flying the Saudi Royals? Pilot: They have many wives and by religion, the men have to treat all wives equally. However, in reality, life happens. Some wives travel in their own fancy aircraft and some use the charter flights. But, they make it up in different ways. For example, they shop like you can not imagine. One time, one of the wives flew to Paris with us and went shopping. This is no regular shopping or even high-end shopping. She went shopping at the top designer houses in Paris! She bought so much stuff that she filled the entire aircraft. But that was not enough, she rented a second aircraft just to carry the remaining shopping!! Us: What makes you think their own jets are better than the charter flights? Pilot: Well I’ve seen them. They’re like their palaces with the most ultimate luxuries you can not even imagine. Us: What do you mean? What is their palace like? Pilot in Birgu, Malta: I’ve been there, sometimes. I can not even begin to describe their grandeur and scale. I don’t know what to compare with. Even the bathroom I used was unbelievable. For example, the faucet was made with real gold! It’s nice to see that a country so young has adopted freedom and democracy so naturally! A Birgu resident stopped to explain how we should avoid the building he was pointing to. It was ancient and not well maintained. In his animated English, he was saying it could fall any time. He’s probably right to be concerned for our well being. This house in Birgu, Malta does look ancient and fragile. While the sea was so calm that I could walk about without Dramamine, it can get extremely rough sometimes. Just two days ago, she arrived at the port, just to learn that the captain had decided to cancel the ferry. All the staff and riders quietly returned from the port. Sometimes ferries get canceled on consecutive days. It’s just nature’s unpredictability. If a ferry got canceled in the Bay Area, it would be a huge deal for all commuters. In Malta the impact is at a different scale – Malta doesn’t grow any food and has no fresh water (other than desalination plants). So, when the ferry is canceled for a few days, grocery stores run low on food and water! The temporary staff doesn’t get paid and tourists get stuck. Malta gets its basic essentials from Sicily in trucks loaded on the ferry. For traditional Maltese people and culture, it used to be common for women to stay home and raise kids. Now, many women like her have to work to have a decent middle-class life. For her, as a single parent, staying home is not an option. She can go to work because her mother watches her son and she works 14 hour days, 3 days a week. The living expenses are sky high, especially renting an apartment. Apparently, Russians are filling up Malta. They’re buying property at high prices and jacking up the price for everyone. Sadly the apartments lie empty while locals struggle to find a place to stay. It’s like the Chinese buying property in Venice, Vancouver, and California and pushing the locals out of the homeownership market. Or Indian NRIs buying apartments in Pune and leaving them vacant. Or Bay Area’s wealthy buying vacation homes in Tahoe while workers struggle to find a place to live. The ftiera is Malta’s must-try food, which to me looks similar to the Sicilian pizza, with different fillings – sheep cheese and potatoes. But, it tastes very different from a pizza. It has many variations all over the islands. Sicily grows food for the region, so Malta gets much of its food from Sicily. She recommended we try the Sicilian arancini, olives, wines, pasta and much more. Our tour was pre-determined, but anyway she suggested lots of places to visit in Sicily for next time. Blue Grotto near Qrendi is a must visit swimming hole and kayaking spot with its crystal blue waters where few tourists reach. I’m glad we followed her advice instead of taking a day to visit the crowded blue lagoon near Gozo. We missed the annual Mdina historical enactment the day before. It was her day off, so she took her kids to visit and they all absolutely loved it. Malta has lots of festivals, everyone should check them out to get a taste of the local spirit. Malta was experiencing an early and massive jellyfish bloom season. They have a crowdsourced reporting process. Volunteers take pictures of jellyfish across the island and report their observations and pictures on Facebook and email. We saw tons of gorgeous jellyfish everywhere. Swarms of jellyfish fill Malta’s coastline that week. Malta’s economy is booming, led by tourism, information technology, and education. Thanks to the right programs and sustained support from the government. I’m most impressed by the foresight put into the education system. It’s no coincidence that all Maltese people speak English and Maltese. In fact, Malta has a strong reputation for the best English education in the region. Malta attracts students for English and higher education from the entire Mediterranean region and much of Europe. As the article below suggests, the policies even encourage international students to work there. It’s the ultimate strategy to fuel the economy with talented young people and secure the future of Malta. Mdina, the silent city has under 400 residents, mostly elderly. During the day, the medieval fort city is a bit lively with tourists but we visited in the evening when it was quiet and beautifully lit by the evening sunlight. We got a glimpse of a couple of residents, well one of them was probably a tourist staying in an Airbnb. Mdina is beautiful in the evening as this native of Mdina goes about her business. We started chatting with the elderly lady, who was walking with a garden watering can. As we started chatting with her, we learned that she was a long time resident. Recently, she found a distressed baby plant peeking through the soil in a nearby house. So she starting caring for it. She didn’t know what plant it was – a weed or a tree or a flowering bush. She just started caring for it and watering it every evening before sunset. In a few weeks, it’s doing a lot better. She was right, to her immense pride, the plant is flourishing. A native of Mdina, caring for her neighborhood. We all choose different things to care for. The things we care for and nurture will blossom. But in the end, we will be the beneficiary of the joy it brings. The old lady, a native of Mdina, was so content and pleased at bringing the plant to health. It reminded me of the ailing orchids I had once restored to health. They brought such joy and pride to me. We visited Marsaxlokk because it’s the picture-perfect fishing village that’s shown on postcards of Malta. But we didn’t expect the village to be so alive with action. Amidst the cafes filled with relaxing tourists, village life was happening in plain sight. Marsaxlokk is a laid-back fishing village. 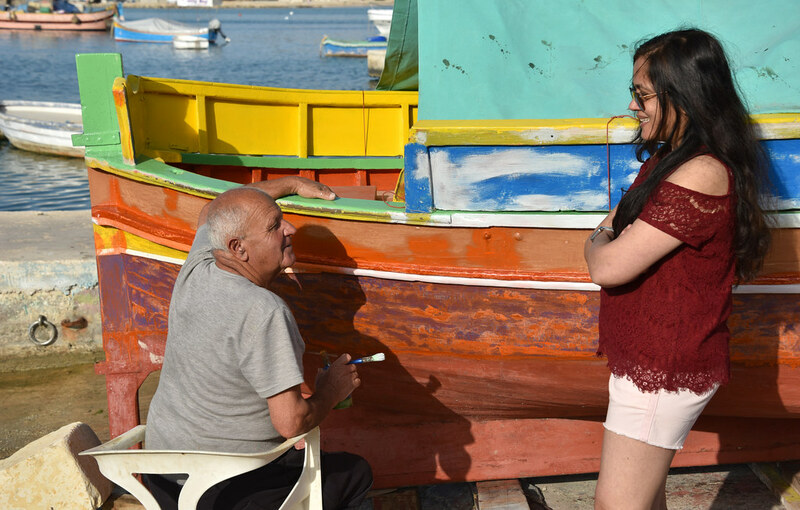 While there are many tourists in cafes and taking pictures on the docks, people of Marsaxlokk fishing village going about their daily lives. We started chatting with many of them and they were very friendly. I wondered, how all the fishing boats look so vibrantly colorful? I got my answer from this middle-aged fisherman who sat quietly painting a boat. It was a little hard to understand his accent but we managed a simple conversation. Us: Hi there, what are you doing? Fisherman: I’m painting my boat. I paint it every two years all by myself with my brush and paints. I’m putting the base coat now. Us: How often do you go fishing? Fisherman: I go out once a week. I used to go more often but now there are too many fishermen and too many nets. We don’t have enough fish. So, I just go once a week. Fisherman: I don’t have a wife or children. I never got married. I wonder why? Is it too expensive with a fisherman’s wages? Malta’s economy is doing so well that they are short on workers. So, they have many immigrants in all kinds of jobs, skilled and unskilled to fill the gaps and to fuel the economy. We met these young hard working boys from Indonesia working as fishing helpers, repairing nets on this gorgeous harbor. Migrant workers repairing nets in Marsaxlokk fishing village. Leisurely life, sitting on the dock of the bay, fishing all day in Marsaxlokk village. As we were talking with the fishermen, a crowd started to gather around. People were dressed up, little boys and older men dressed as priests. Obviously, I wanted to know why, so we started talking with everyone. Us: Hi, what’s going on? A Mom: We’re getting ready for the parade. A Mom: Its the Santa Maria parade. It happens every year to celebrate Malta’s patron saint. We all walk down the street along the harbor to the church. The church and streets are decorated and people from everywhere are seated on chairs to listen to the preacher. People of Marsaxlokk fishing village were all so friendly, but this little boy was the most adorable. He talked all about his toy cars while dad dressed his big brother for the parade. Soon, everyone gathers around to take their places in the parade – first the older priests with a cross, followed by boys in black gowns with white tunics, followed by men carrying a picture of Santa Maria and then the entire village. They all walk somberly and slowly from one end of the village to the church in the center of the village. In the annual Santa Maria event, all the people of Marsaxlokk fishing village, come out to join the parade. Outside the church were at least 100 chairs facing a podium, where I suppose someone will give a talk. As it was time for our dinner reservations in Mdina, we took out our car to head out of the village. To our horror, all roads were closed. There was no way out of the village, except on foot. So, we asked one of the policemen hanging out. To our delight, the policeman graciously removed one of the road blockers so we could pass before the parade reached us! In the US it’s unlikely a cop would bend rules, even if the parade was 30min away. In India, if in the remote chance there was a cop, it would take a few dollars to pass through even if it meant driving through the procession. On our last evening in Malta, we ventured into Shiva’s restaurant for dinner. However, the senior server at Shiva’s could not answer our questions so he said he’ll send someone who knows Indian food. The server he sent was a young Indian student, on a temporary work visa. That was great because she knew Indian foods and was able to tell us all about the menu and ingredients. As always we started chatting and her story got really interesting. Here are some excerpts that tell us so much about employment and economy in this part of the world. Us: Where are you from? Student: I’m from Kerala but I’m a student in Poland. I’m working on my Master’s degree in international tourism. I’m spending a semester in Malta. Student: I had been working in India for three years as a tour operator. After a while, I realized that I need a masters degree in international tourism to progress my career. My friends were going to a university in Poland so I looked into it. They promised internships and jobs in the European tourism industry. So I applied and got in. Us: Cool! How did that work out? Student: Well, that was just good marketing. They have no jobs or connections to get good jobs. The few jobs in Polish companies are too low paying and require the Polish language. Us: What is it like to live in Poland? Student: Living in Poland is very hard. Everyone speaks only Polish. It’s hard to find anyone to talk to, except fellow students. Good food and living are a problem. I share an apartment with another international student so I’ve been ok. Us: Is the university’s education good? Student: The coursework and education are good. So, I want to finish my degree in Poland. But, I know I will not find any jobs there or in Europe. Us: What brings you to Malta? Student: I need to make enough money to pay for next semester. Some friends told me there are many jobs in Malta. So, I came here. But, most tourism jobs require standing in the sun handing flyers for hop-on-hop-off buses and the many attractions. They pay very little and work is exhausting. I luckily found this job at Shiva’s and I like it. Us: Will you return to Malta after you graduate? Student: I don’t know yet. I may become part of the Maltese people and culture or return to India and get a better job in Indian tourism. That’s a smart young lady. Indian tourism industry is booming. The international exposure, multilingual skills, Indian local experience will certainly move her up in her career while being close to family, friends with good living conditions and good food. Sarajevo under Siege (1992-96) tells the story of Sarajevo under siege through the life’s story of a 30-year-old living historian and guide. Sarajevo’s Tunnel of Hope is the story of human resilience, sacrifice, endurance and the tenacity to live in the face of imminent annihilation. Stories of villagers living in the dunes of Rajasthan’s Thar desert.